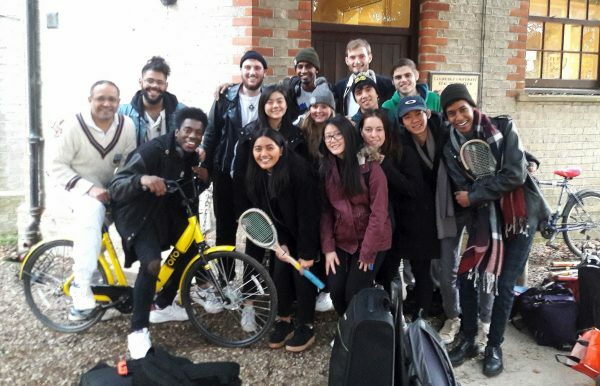 For four days in late November, Cambridge and Newmarket Real Tennis clubs hosted over 60 fresh-faced students from nine universities across the UK for the annual Inter-University tournament. In addition to tournament debuts from St Andrew’s University and St Mary’s University, this year saw the return of Oxford to the tournament, along with strong delegations from Exeter, Bristol, Newcastle, Durham, Middlesex and the hosts Cambridge. Newcastle, Durham and Middlesex arrived in Cambridge for the start of play on Thursday evening, kicking things off with the first three groups in the handicap singles tournament. Despite the long travel, Hubie Sangster (Newcastle) was the first group winner through to the knockout stages and was joined there by the Middlesex pair of Juan Camacho and Luke Newman. The tournament began in earnest on Friday morning as the remainder of the teams filed into Cambridge. The day started with the first round of the Inter-University Cup. Each University fields a number of teams of two or three players, and each fixture comprises of two singles and a doubles match. This year, the teams were seeded, so the stronger teams would only be joining later in the competition. Even still, three teams collected 8-0 clean sheets across all three of their matches, the most excitement coming in the match between Cambridge 4 and Middlesex 3. Tied 1-all after the singles, the result came down to the doubles. A late surge by the Middlesex duo of Prabhiyot Kang and Harry Ashton was too much for Elle Curzon Green and Sophia Lewis; Middlesex taking the fixture 8-5. The remainder of Friday was consumed with most of the rest of the group stages of the handicap tournament. The first appearance for St Mary’s University at the tournament began well, with club founder Trevor Jones winning his group losing only a single game. 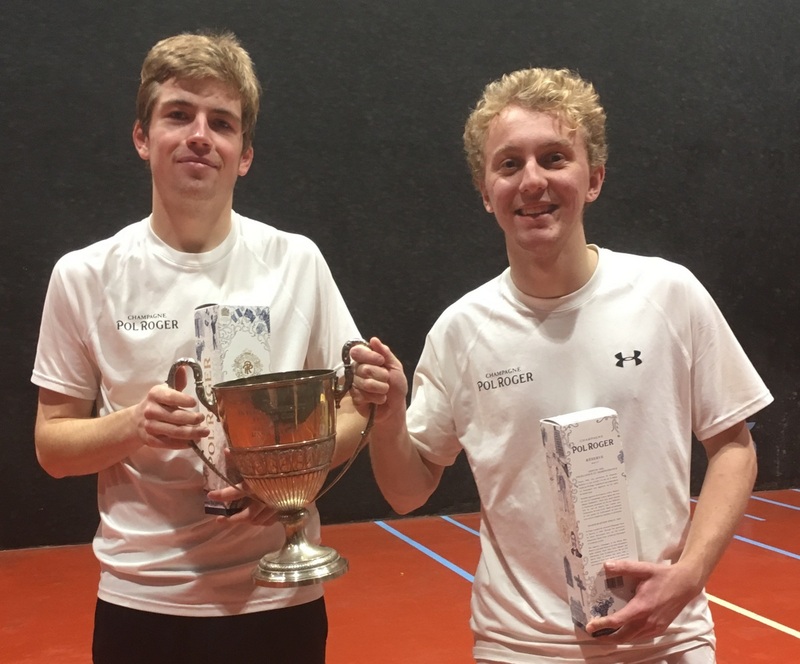 Elsewhere, rackets players Ivo Macdonald (Cambridge) and Felix Delaforce (Exeter) showed how similar the two sports are, cruising to victories in their respective groups. Bristol also had a good afternoon, all four of their entrants (Jamie Day, Louis Richards, Valentine Scott-Geddes and Alexis De Chaisemartin) making it through. Sophia Lewis (Cambridge) narrowly won her group on a countback of games won. The group stages were also played over at Newmarket, with Charlotte Facto (Newmarket) winning her group, with Krittika D’Silva the Best of the Rest after a narrow 4-5 loss to group winner Scott-Geddes. That evening, the top two groups with the lowest handicaps played in Cambridge. This served as a preview of the Cup matches to come, but saw some excellent tennis. Charles Defries (Oxford) arrived late owing to the withdrawal of Rory Giddins (Oxford), but then breezed past Jimmy Campbell (Cambridge) and Oliver Martyn-Hemphill (Durham). Finally, George Skinner (Durham) came tantalisingly close, but was beaten by Felix White (Newcastle) in a tense 5-4 showdown. Saturday would see most of the knockout phases of the Inter-University Cup. These produced a series of very close and very long matches that would put the schedule hours behind. The biggest run was made by the Bristol team of Louis Richards and Jamie Day. After a narrow 8-6 game between Richards and Felix Delaforce (Exeter) which included 14 deuces, their match against the Cambridge 2 team of Jack Drew and Ben Geytenbeek was tied 1-1 after the singles. Cambridge took too long to settle down in the doubles, and some excellent railroad serves from Day took Bristol to victory. 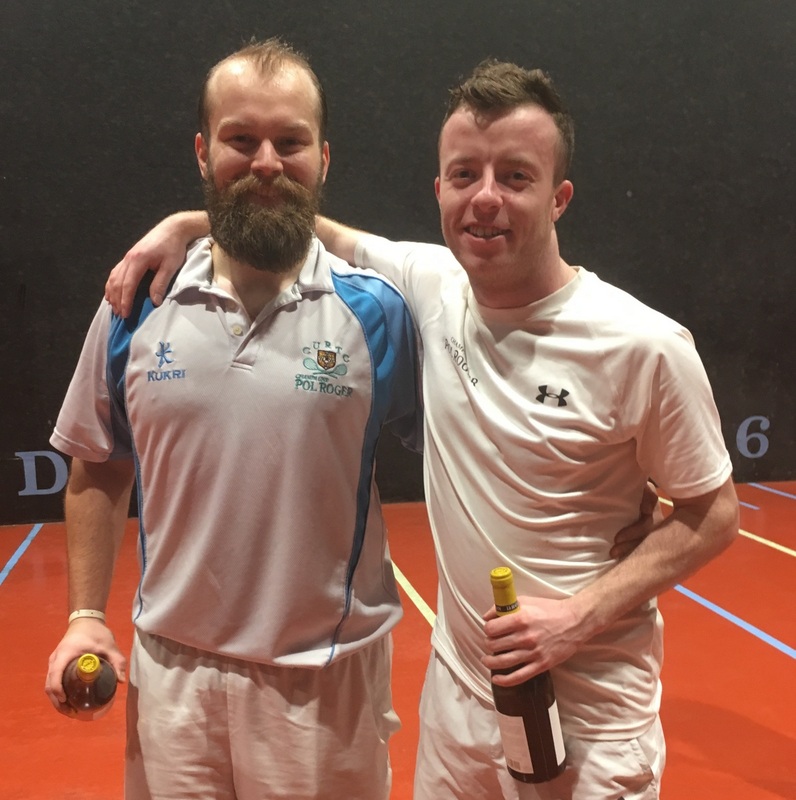 Newcastle 2 received nothing but consolation for their doubles win over Cambridge 3’s Ivo Macdonald and Aaron Wienkers, after Wienkers has held on 8-7 against William Robertson. 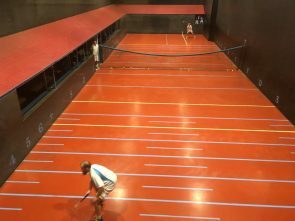 Elsewhere, the tournament debut for St Andrew’s University did not go well, losing to the Newcastle pair of Charles Walker and Charles Seddon. However, the top seeds of Oxford, Cambridge, Durham and Newcastle were a class above the rest of the field, all breezing through the quarter-finals, except a tight 8-7 victory for James Bargent (Newcastle) over Jamie Day (Bristol). Over at Newmarket, Elle Curzon Green (Cambridge) became the final group winner in the Handicap Singles tournament, rushing back to Cambridge for the knock-out stages. Running over-time, the last few matches of the day was the round of 16 of the handicap singles. 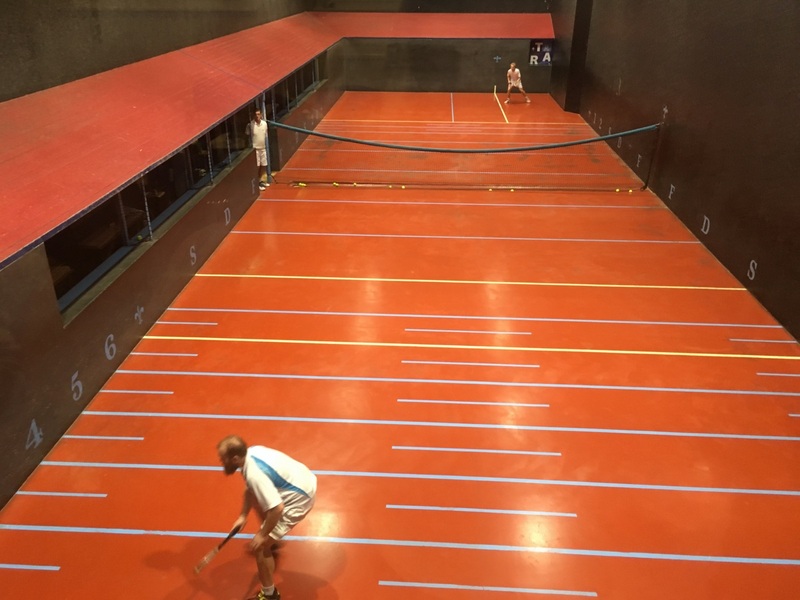 Notable matches included Elle Curzon Green (Cambridge) starting with a 43 point handicap advantage and banned chases worse than 3 against Charles Defries (Oxford), and pulled through to a 6-4 victory. Perhaps the most dramatic moment of the tournament came between Trevor Jones (St Mary’s) and Louis Richards (Bristol). At 5-all, 40-all, match point, Richards let go of his racket during his serve, and Jones capitalised by making a chase of a yard. But then a below-average serve saw Richards pummel the ball straight and hard into the dedans to win the match. The excitement carried on to the Pol Roger Champagne Reception and Tournament Dinner held at the University Athletics Pavilion, down the road from the tennis courts. The Pavilion had been transformed into a lovely dinner venue and we were fortunate to have the company of a handful of tennis greats – Paul Weaver and Duncan Colquhoun, current over 60s Doubles champions, along with Chris Bray, former British Number 1 – to add even more inspiration to the event. Paul and Tori Weaver joined us as representatives of the Dedanist’s Foundation, which gives considerable support to many of the Clubs which enter the Inter-Universities Tournament. It was a great evening with a well-earned glass of Pol Roger Champagne followed by some excellent red and white wine to accompany the delicious meal. Many thanks were given to Pol during the speeches, for their fine contribution to the event. Sunday was the final day of the tournament. In the handicap singles, Felix Delaforce (Exeter) and Juan Camacho (Middlesex) breezed through their quarter and semi-finals. The final match was a test of Delaforce’s rackets skills of boasting and retrieving against Camacho’s solid forehand and reliable volley. Ultimately, Delaforce took a good victory, 8-3. In the Inter-University Cup, both Oxford and Cambridge beat Newcastle and Durham to turn the final into an abbreviated Varsity Match; a sneak preview to the match at Lord’s in March. Ed Hyde (Cambridge) retrieved well against Rory Giddins (Oxford), taking victory in his match. But Charles Defries (Oxford) returned serve well against Jimmy Campbell (Cambridge), and despite a close match, Defries was able to put it to a deciding doubles. Oxford held against everything that the Cambridge pair threw at them, ultimately taking the match and the 2018 Inter-University Cup. It was a hugely successful tournament, and accolades must be given to the Cambridge professionals Kees Ludekens and Peter Paterson, along with Vix Harvey for their hard work organising the tournament and marking all of the matches on the final day. Thanks also to the Dedanist’s Foundation and the T&RA for their support of the event. It was a fantastic tournament, and great showcase of the talent in the future of the game. Ben Geytenbeek, reporting from the Cambridge Dedans.